The intoxicating floral fragrances of Sweet Pea and a delicate Jasmine, with a hint of fresh Melon and Cantaloupe. 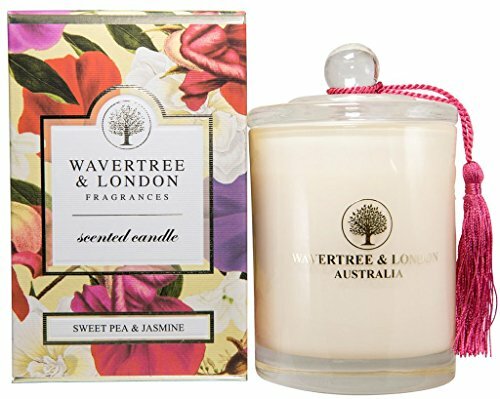 These decadent Wavertree & London Candles are carefully hand poured into our unique glass containers to create an intense aromatic experience. All our fragrances are truly exceptional and have been created by us to give a long lasting and exquisite perfumed ambiance. View More In Aromatherapy Candles. If you have any questions about this product by Wavertree and London, contact us by completing and submitting the form below. If you are looking for a specif part number, please include it with your message. Hosley Set of 6 Peppered Oak Wax Cubes- 2.5 oz Each. Hand Poured Wax Infused with Essential Oils. Bulk Buy. Ideal for Weddings, Spa, Reiki, Meditation Settings W1. Premium 100% All Natural Soy Wax Aromatherapy Candle - 6oz. Tin: Scent - Vanilla Hazelnut. A mouthwatering blend of toasted hazelnuts and creamy vanilla. Naturally Strong, Highly Scented.each. Premium 100% All Natural Soy Wax Aromatherapy Candle - 8oz. Tin: Scent - Vanilla Hazelnut. A mouthwatering blend of toasted hazelnuts and creamy vanilla. Naturally Strong, Highly Scented.